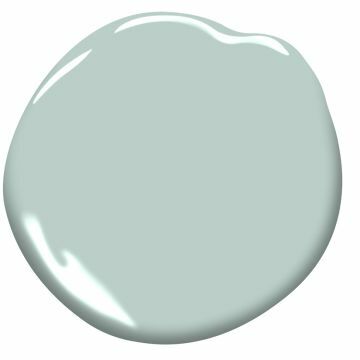 I am trying to decide what color to paint the bathroom vanity and I'm thinking maybe a soft blue. There is going to be so much taupe, beige and white that I think blue or a blue gray might be the way to go. When I mentioned this to Mr. Savvy he said what??? Yes, dear, I may choose blue. He just figured it would be white....no, maybe not. 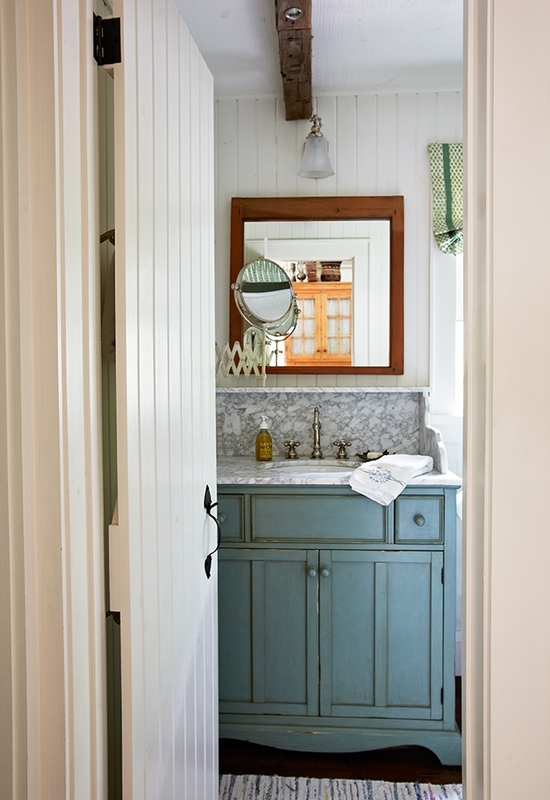 Here are some inspiration photos of blue vanities. 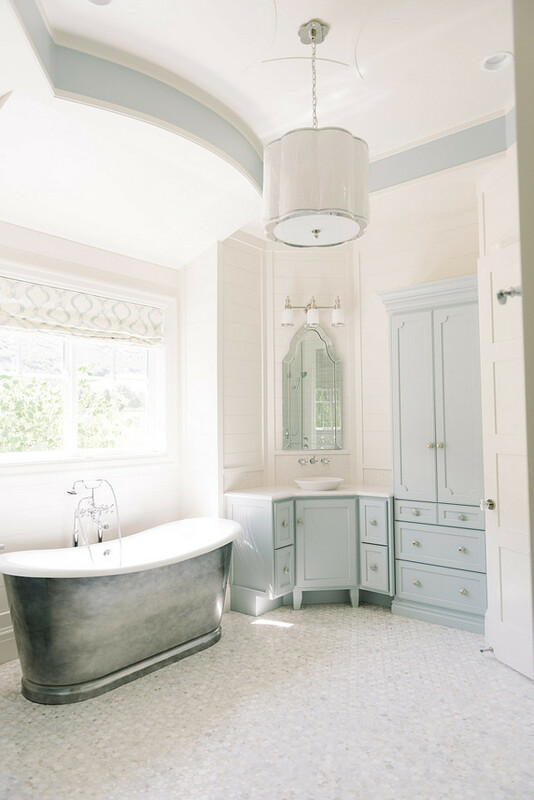 I really love this bathroom by Anne Hepfer Designs and even the tub and built in is similar to what we will have. This is a bit darker than I would like, but a pretty color. Here are some Benjamin Moore paint colors I'm considering. Has anybody used any of these colors on cabinets? I like the colored vanities. I loved one on Emily Clark's blog - hot pink! My only concern would be I like my master bath and master BR to coordinate. Not match, but I carry the same colors (aqua/ivory/lt.brown through both rooms. You may not carry the same colors through both rooms, so it may not matter to you. I do have some blues in the bedroom and throughout the house. 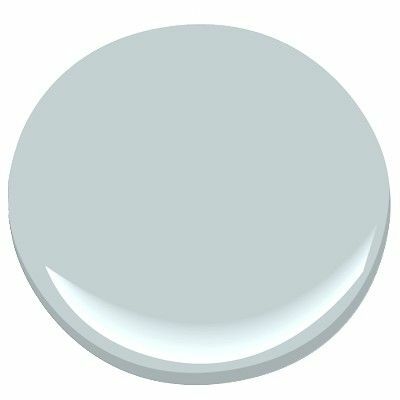 A soft gray blue is a neutral and I don't venture out too much with odd colors in the bedroom. They stay neutral. I did red one time, but I don't do red anymore. Gorgeous rooms! Tell those contractors to hurry up because inquiring minds want to know what you pick. I love the idea of a blue cabinet. I sort of like the 3rd one down where the lady forgot to put her shoes away :) It's a nice subtle blue that is rich looking. 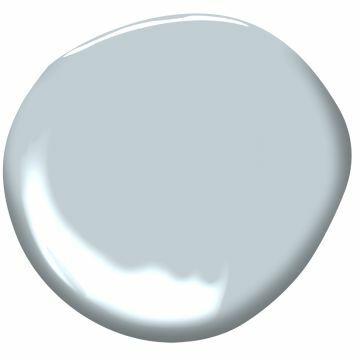 I love the idea of a soft gray blue. That would be so pretty. I love the idea of a soft blue, it has a spa like feel to me! I say go for it! Love them all! Can't wait to see your bath all finished. I like the idea of a painted vanity. These are all lovely. I don't remember about cabinets, but Miss Mustard Seed used Glass Slipper on her family room walls in her old house. I think photos are still on her blog. I would be careful with gray blues. I like them better with gray/greige/white walls. Some blues don't look as good with beiges in my opinion. I probably shouldn't have said beige. The tiles are more taupe, the walls and trim will all be white and the floor is a grayish color. I love painted cabinets! Glass slipper.....soft and lovely! I love the colors. Very soothing. I have used Beach Glass before and love it, changes color depending on the light. I have a blue vanity and I love it, and its similar to some of the blues you are considering. Why not?! They are all lovely. Can't wait to see what you decide. Love the pale blues and the pale aquas. GLAss slipper is great, woodlawn blue is very pretty but might come off darker than you like. So pretty, love a soft gray blue. When looking at that combination I always go to the gray side first and then follow over to where the blue is being added. I never start on the blue side of the color deck it is almost always toooooo blue. Just a little FYI for you day!! It is going to be gorgeous!!! I will take the first bathroom in Silver Gray please!!! Gorgeous! I love the subtle and light green blues, or gray blues. Light enough and neutral enough that it can can probably work for years and years. Can't wait to see your final decision! Yes, all beautiful pictures! Love the grey blue colors. The first picture was one of my main inspiration pics too! Soft French blues. I love them. Perfect for your French flavored home. I haven't used any of those particular colors. I would get samples and a paint boards with your choices. Then place them in your bathroom and observe them at different times of day and see which one you love. Sometimes they are a lot lighter than they look on the samples. I brought home three bottles of sample colors that looked a nice light gray on the cards only to find them to be white with almost no color when I put samples on the walls. As much as you paint things, I'm sure you've experienced this as well. 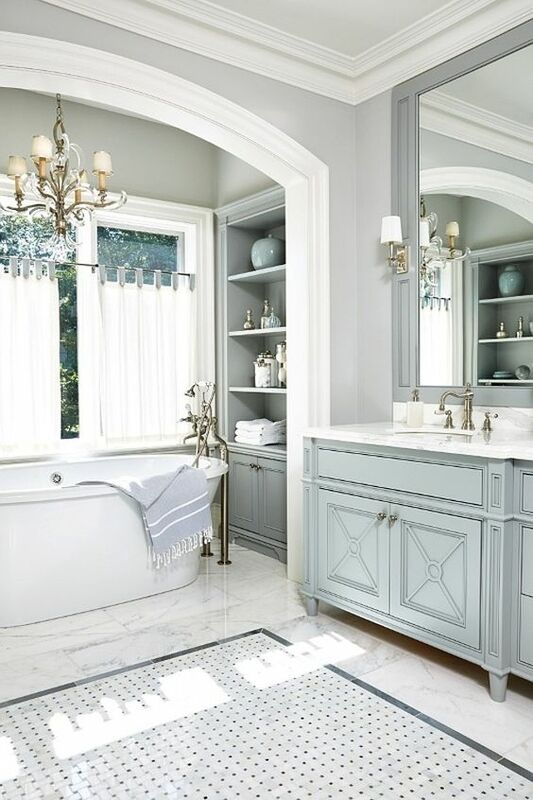 all gorgeous inspiration baths. when we do a bath reno at the end of the year I am headed in this direction as well. good luck with your choice. im sure whatever the color it will be beautiful. Have you looked at Benjamin Moore Quiet Moments? We're using that on the walls in our bathroom, but it's be pretty on a vanity, too. I like the first bath with blue cabinet. The paint colors all seem to have a green tint except the first two. A soft blue would look awesome with the other colors you are using. I just painted vanity a medium gray to contrast all the white in our new powder room. Whatever you choose will be beautiful, I'm sure. Can't wait to see what you choose. was something wrong with my comment dated 8/3/17?? could you tell me why the reply was deleted? It wasn't deleted. It's right above. I painted a black vanity I bought at Ikea in a very soft blue, Borrowed Light by Farrow & Ball and it looks really pretty with the white sink and top I have. I bought 16 samples of paint until I hit on the right blue for our kitchen and powder blue for our cottage here on the Chesapeake. Not too gray or green or blue. I finally found Valspar Pond Ice. I had it mixed in Benjamin Moore base paint.